My front yard was ho-hum at best when I moved into my house several years ago. Industrial shrubs, lavender bushes and Japanese maples marched in rows across a pebbled landscape, punctuated by cobblestone patches. Because the yard’s only redeeming quality was a beautiful oak tree a few feet in front of the house, I vowed to replace the random, water-gulping plants and create a native wildlife habitat garden surrounding the grand old tree. Last spring, I sat gazing at my transformed front yard, serene under several inches of fresh sawdust—all that remained of the oak tree, which had begun to invade my house and its foundation several months before. Here and there a shrub poked above the yellow-brown frosting, but otherwise it was a blank canvas. Without the oak tree, my yard was in even more need of an overhaul, and the time was right for a whole-yard renovation. Beneath the blank surface, I found the sedimentary layers of my yard’s rich history, like a geological formation. As I excavated, I uncovered remnants of former groundcovers: rounded pebbles, sharper rocks, jagged white rocks, dyed-red pumice stones. And under all that? A layer of plastic covering the entire yard, limiting root penetration, suffocating soil microorganisms and allowing rainwater to pour off into the street. Before I could plant, there was work to do. As with any design challenge, my first priority was to assess the site’s gifts and challenges. I considered my home’s west-facing orientation. Like most in my neighborhood, my home mostly faces the backyard, but the front yard and rooms (my office and a bedroom) bake in the afternoon sun, becoming uncomfortably hot. However, prevailing breezes also come from the west, and the front yard provides a relaxing view of oak-studded hills to the north. I have no front porch, and activity on the street is minimal. 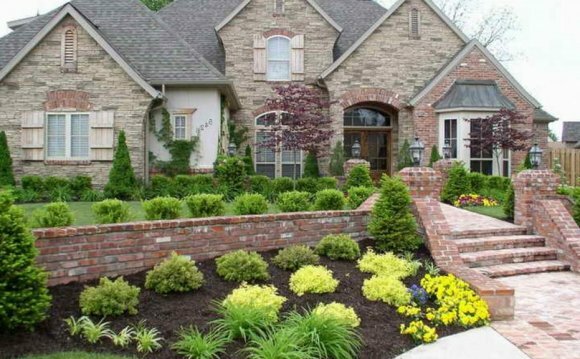 The front yard would require a major overhaul, so I needed to think about the soil and hardscape already there. The heavy clay soil would alter many of my plant selections, as many of my favorite plants prefer well-drained soil.Getting down to bare dirt in the front yard would leave me with big piles of rocks, dirt and sawdust, which I didn’t want to send to the landfill. I also noted that my backyard had a lovely spot for a shade garden, under the long branches of a willow tree along the adjacent creek. Finally, I had to consider social and fire-safety issues as I planned my new landscape. Fire safety suggests a “defensible zone” around the house, free of flammable plantings. Before we removed the oak tree, my arborist pointed out that dropping tons of wood would likely damage the front-yard plants. We dug up and replanted the lavender bushes and Japanese maples in the shadier backyard, and I offered the remaining plants to my neighbors. After the oak was gone, I hired laborers to peel back my front yard’s layers. At the end of the day, I had a bare-dirt slope, a huge sawdust pile and smaller piles of cobblestones, round rocks, little sharp rocks and clay soil. I envisioned chaparral and sagebrush plantings—drought-adapted and appropriate for this hot, dry front yard. I began to select native manzanita and toyon, sage and coyote brush, and wildflowers such as monkeyflower, California fuchsia and California poppy. My rancho would even have a classic row of big, gray-green agaves to greet visitors. Next I added an arbor-shaded patio, made from willow branches harvested in the backyard, along the front of the house. This helps enhance the place’s ranch image, provides a hang-out place, shades the house from the hot afternoon sun and creates a plant-free, fire-discouraging zone. The MXF format allows you to view and to edit videos in multiple applications and on different devices. However, it is not as popular as, for example, MPEG-4, and files with the .mxf extension are not opened by standard means. Additional programs and codecs are needed. Downloading them can be unsafe, so we recommend another way to solve this problem: convert MXF-files in one of the formats read on any computer. Go to Convertmxffiles to use an excellent mxf converter. You may download it, or use it online, it can be used as player as well.